@support I restored ‘Alexander’ from a cloned backup using Carbon Copy Cloner; Plex, Backblaze all see this as the original ‘Alexander’ on a Drobo 5D, but Roon has the’Drive Not Ready’ message. Files are in the same place, same volume name, same everything. What do I do now? I did a restore from backup and I get the same message. I did not think this applied to macs though. Same issue here on a Mac as well, and same solution. Clearly not limited to Linux machines. Did you also have a ‘panic moment’ ? I did a whole restore from backup before I managed to find a solution via the forum. Hey guys – we understand the underlying issue here, and we’re testing some improved behavior in alpha right now. Hoping to release that soon, but this generally shouldn’t be a big deal. This error simply means we tried to scan the watched folder and couldn’t access it. You’re probably getting this because of how we’re trying to identify the drive, and that’s the exact behavior we’re currently improving. 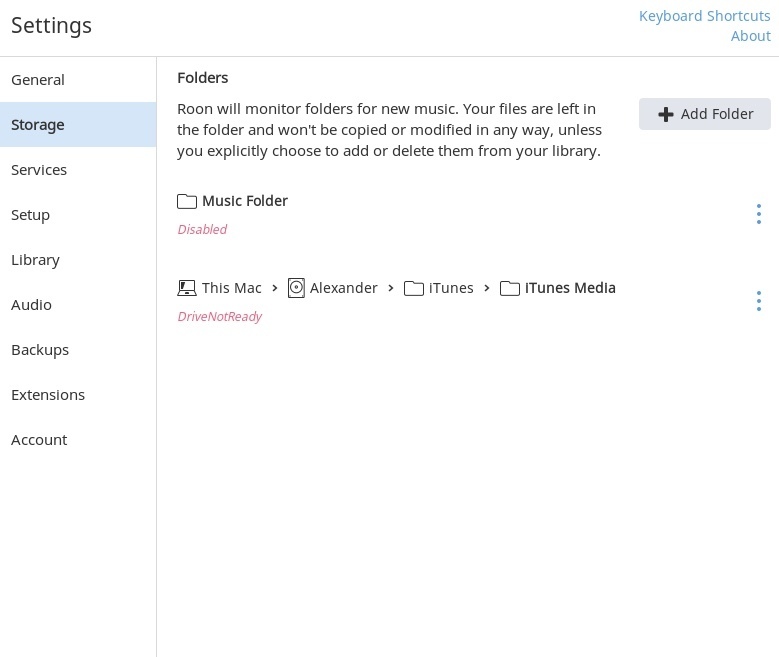 Since 1.3 was released, it’s been easy to edit a storage location when Roon is unable to find it, or if it’s location changes for some reason, and this is a nice safe way to point Roon at a new location for your files. One thing to note here – when you are in this DriveNotReady state, Roon assumes the files are missing temporarily and the folder will be coming back online at some point. This means if you ADD the folder’s new location (as opposed to editing or removing the previous reference) the files will be rescanned and imported as new, because Roon will be tracking the file in two places. Yes, this is what happened when I deleted and readded the same location. A restore from backup and the ‘edit’ option and all was well.